The Short-tailed Hawk (Buteo brachyurus) breeds in Laguna de Apoyo Nature Reserve. 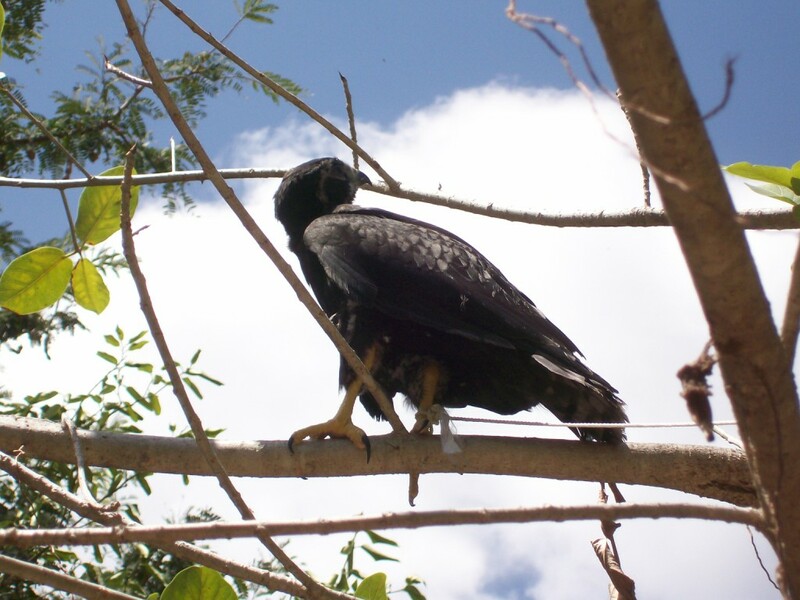 One of the park guards rescued a chick from some boys who had stolen it from a nest high in a large ceiba (Ceiba pentandra) tree. By the time the bird reached us, he had diarrhea and was not happy. We are often not so fortunate, but this one survived, and became a wild, adult bird in the forests within several weeks. Once he was strong enough, we began giving him flight practice. At first, he anxiously eyed other birds and all nearby movement. He soon lost his fear of the other birds, however, and he even would give them an evil stare, as if they would someday be his. In these photos, he was tethered, learning to fly and deal with the wild environment. 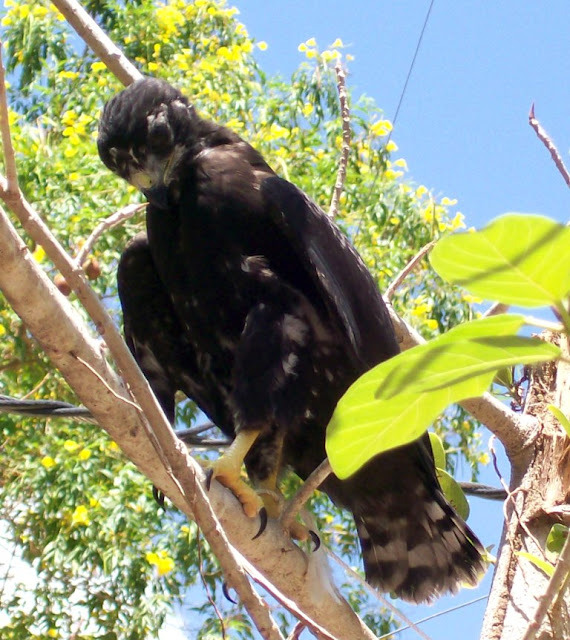 Before he was set free, he was given several days of "supervised" freedom, during which he practiced flapping while held, flew short distances while tethered, and spent afternoons perched in a nearby tree. The bird absorbed the experiences of passerines that harrassed it, and gained body strength and mobility. 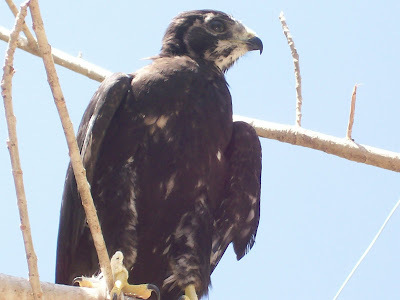 Fledgling Short-tailed Hawk (Buteo brachyurus) at Estacion Biologica, Laguna de Apoyo Nature Reserve, Nicaragua. Photo by Jeffrey McCrary. His flight feathers came quickly with good nutrition, and he became confident. ﻿While he enjoyed the attention of people, he demonstrated a marked preference for the wild immediately. He never became too domesticated. The Short-tailed Hawk chick looks suspiciously as a Tropical Mockingbird taunts him. Photo by Jeffrey McCrary. He enjoyed watching all around him, especially the nearby birds which were none too happy about his obvious presence. Nonetheless, with just a piercing glare, no bird dared to approach him. When he first arrived, he was weak and sick with diarrhea. Thanks to the care of our staff and veterinary treatment, he improved and grew. Once his first-year plumage began to come in, our volunteer Joe Taylor analyzed him and diagnosed him as a Short-tailed Hawk, dark color phase. Soon his feathers grew and we all agreed! Shortly after these photos were taken, we released him to the wild. He never again permitted a human to touch him. He returned daily to Estacion Biologica, however, and begged our cooks for food, perching on a rail just outside the kitchen and crying. He was given raw chicken or beef daily in this manner for another three weeks, after which he began to return less frequently. We sighted him more distantly from Estacion Biologica as time passed. After about two months, he no longer returned. 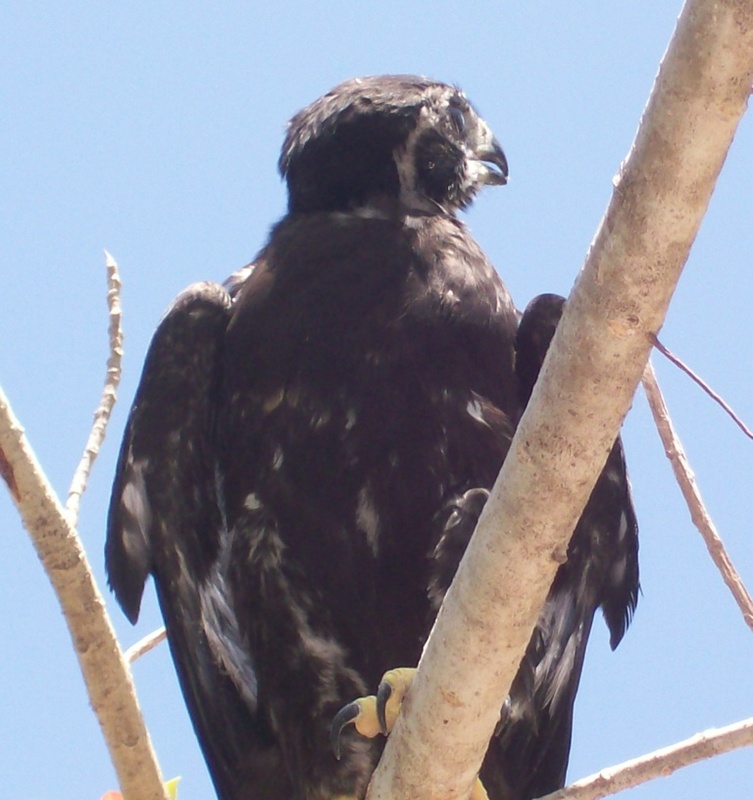 We often have seen a dark-phase Short-tailed Hawk in the forest since then, and we like to think it is "ours". 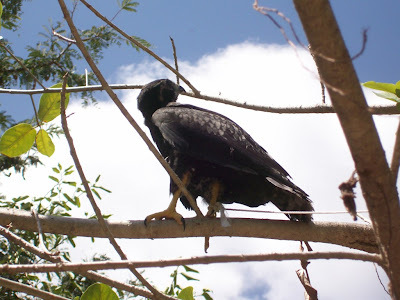 This majestic bird came from and returned to the forests of Laguna de Apoyo Nature Reserve, and can be seen by nature tourists. Although other hawks are more common, this bird is an example of the quality birdwatching that can be done in these forests. The FUNDECI/GAIA bird list for the area has 225 species, and our birding guides can help you find and identify them. 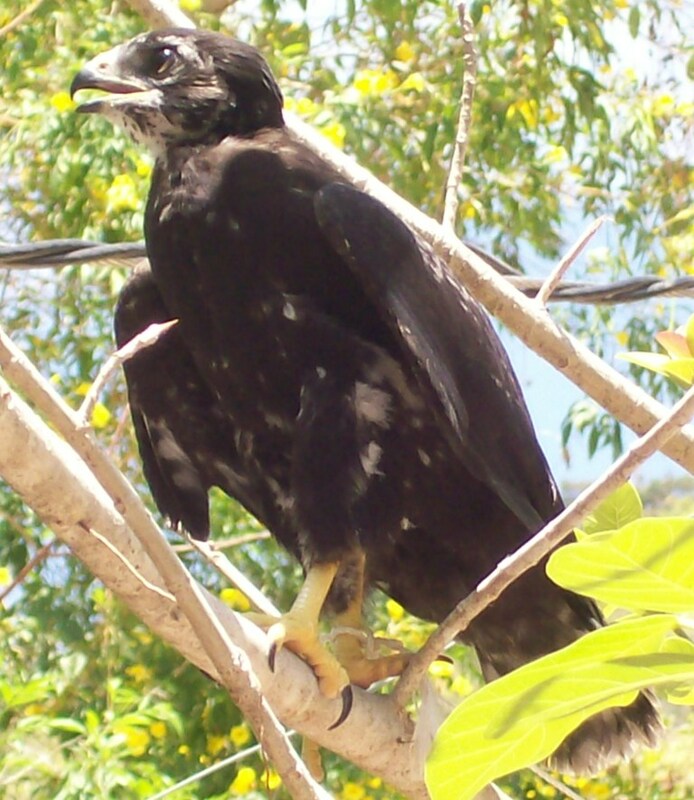 Contact us if you would like to arrange a birdwatching or nature lovers tour in Nicaragua. Although most of our Spanish language instruction is performed one-on-one at Apoyo Spanish School, we often handle groups for Spanish classes, volunteer work, and environmental and cultural training at Estacion Biologica. 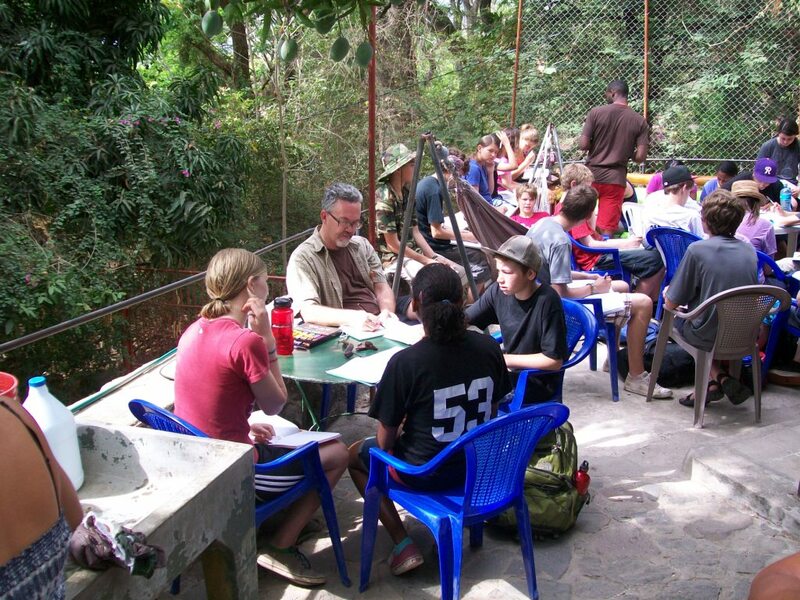 The Laguna de Apoyo Spanish Language School is the oldest in Nicaragua. Here are some images from a recent group from a school in San Francisco, California. This group studied Spanish with our local teachers, participated in reforestation activities, and participated with our volunteers in mist netting of birds, a practice we use to monitor bird populations in the Laguna de Apoyo Nature Reserve. They also went tarantula-watching one evening-although many were deathly afraid of them beforehand, afterward, they all felt better about them! 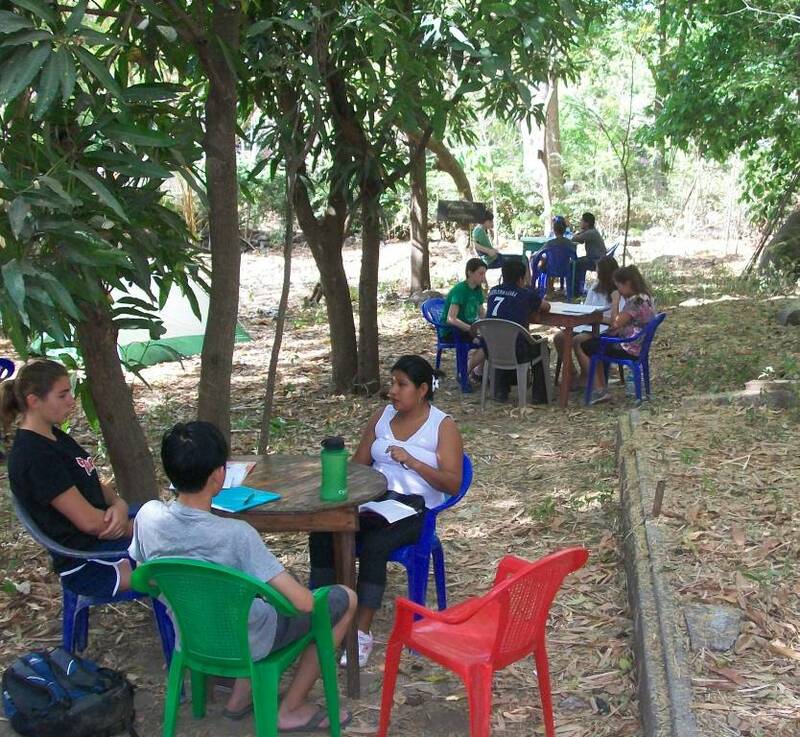 And they participated in some discussions about the environment and social conditions in Nicaragua with members of our staff at FUNDECI/GAIA. The shade of tall trees makes the best stting for Spanish study. Miss Mariposa, Aura is a language professor and also an expert at birds and moths and butterflies. She will gladly take you birdwatching. She participates in several research projects at Estacion Biologica. Photo by Stephan Beekhuis. The young people enjoyed a swim at the beach in front of Estacion Biologica after Spanish classes. Photo by Stephan Beekhuis. 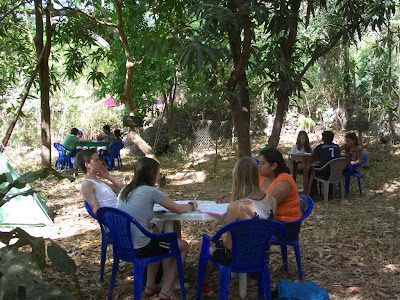 A mango provides refreshing shade from the midday sun for these students, who are practicing diction. Photo by Stephan Beekhuis. Our ample yard at Estacion Biologica is in front of the lake for a fast entry once classes are over! Photo by Stephan Beekhuis. 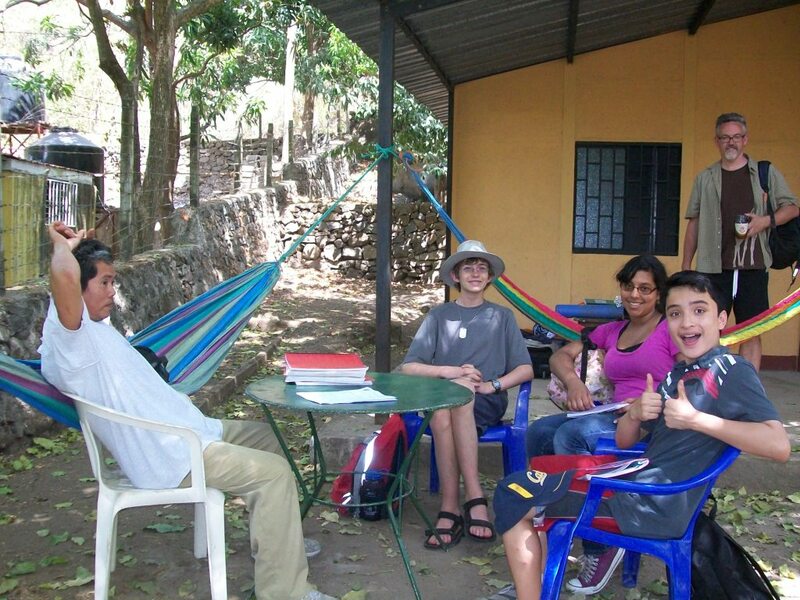 As can be seen on the left in this picture, we often have campers at Estacion Biologica. Photo by Stephan Beekhuis. Our volunteer, Soren, is explaining how we use mist nets to study birds to the group of Spanish students in an after-class activity. Photo by Stephan Beekhuis. Soren is responding to questions about bird study and conservation. Photo by Stephan Beekhuis. 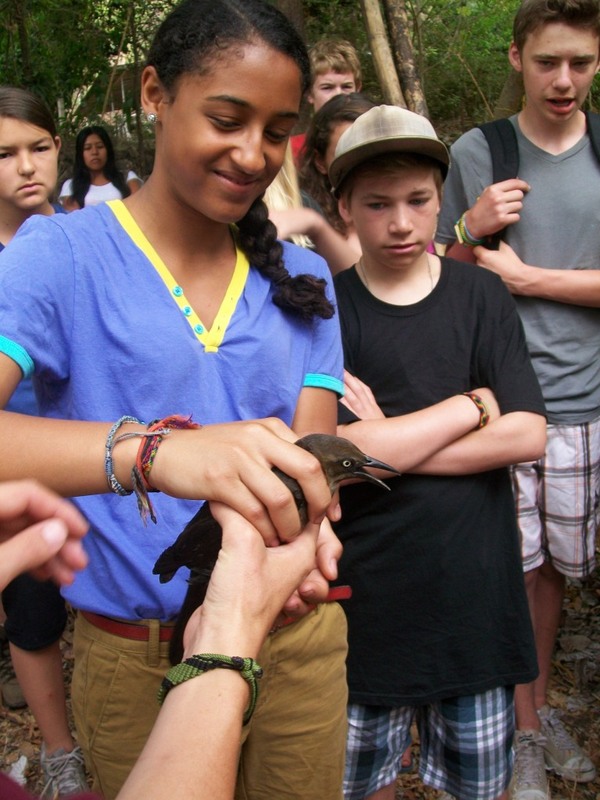 A Spanish student learns to hold a captured bird during a mist-netting demonstration for the group. This individual is a female Great-tailed Grackle. This species is present where human activity is intense, such as yards of homes. Photo by Stephan Beekhuis. Spanish students and their teachers are enjoying a relaxing moment before dinner at Estacion Biologica. Photo by Stephan Beekhuis. After Spanish class, students joke around with Lorenzo. Photo by Stephan Beekhuis. We are happy to provide experiences in Spanish language instruction, culture, and nature by sharing our own experiences with others. 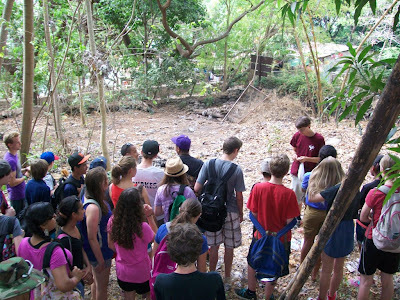 We can handle groups of up to a few dozen in size, and we can provide ecology exercises, discussions on culture, society and politics in Nicaragua, Spanish courses, and lots of fun. Please contact us if you would like more information. 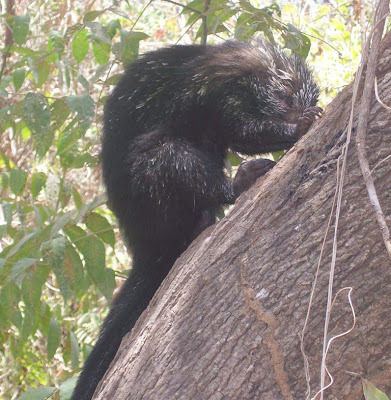 The Mexican Hairy Dwarf Porcupine (Sphiggurus mexicanus) is not a commonly seen animal. Although it is slow and not very small, it is retiring and blends in well. And some of its hairs transform into sharp spines as they age, providing them with a passive defense mechanism. Here we show photos taken of this animal in Laguna de Apoyo Nature Reserve, Nicaragua, some 100 meters from Estacion Biologica. 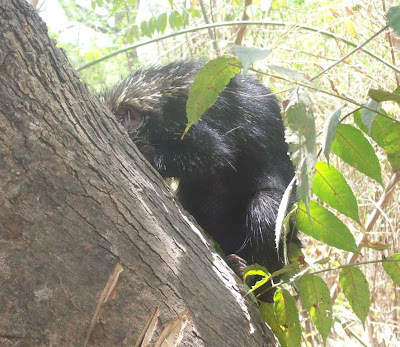 Mexican Hairy Dwarf Porcupine (Sphiggurus mexicanus) in Laguna de Apoyo Nature Reserve, Nicaragua. Photo by Pablo Somarriba. ﻿ Although they are supposedly strictly nocturnal, this individual has ventured out in broad daylight on a tree on the main road in the reserve. We informed a park guard who remained near him for a few hours until the animal retreated into the forest. This species is nocturnal, solitary, and is thought to be strictly vegetarian. However, when we looked at these photos, we wondered whether this individual was feasting upon termites which are seen in a tunnel on the tree trunk, or perhaps on the tunnel itself which is made of semidigested plant matter. ﻿ It has a long prehensile tail which is evident in these pictures. 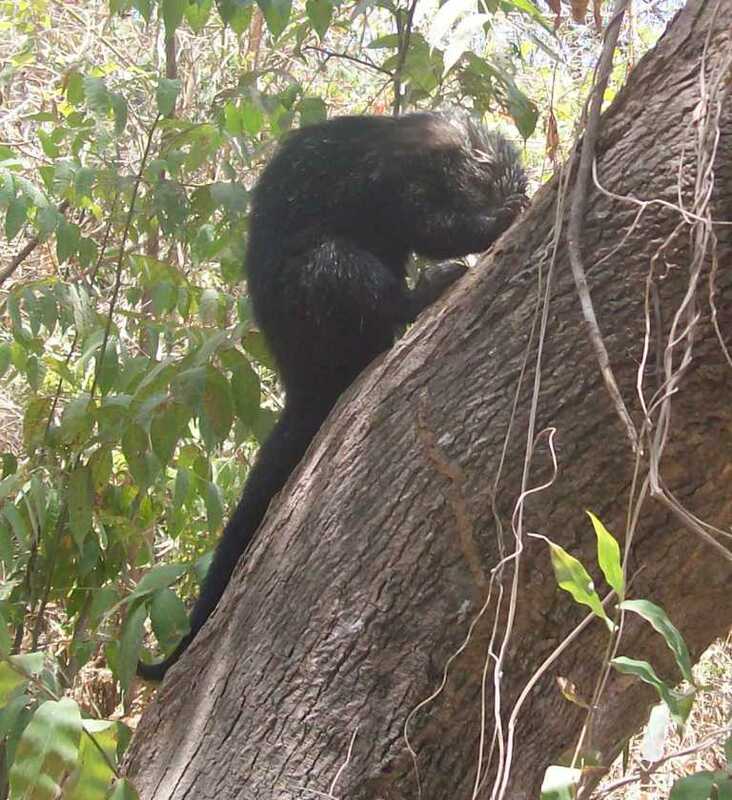 Once somewhat common in Laguna de Apoyo Nature Reserve, a sighting today is remarkable. The porcupines are often killed by locals because dogs may bite them and be affected by their spines. ﻿ It was a special treat to see this animal, because they are not common and not out during the daytime Several students from the Laguna de Apoyo Spanish School got to see the animal, too! Please let us know if you see any special wildlife in Laguna de Apoyo Nature Reserve. We are always interested. This week, our team of Marlene Kroner, Lucas Betthausen, Soren Kraack, and Lorenzo Lopez conducted bird population monitoring by mist netting in Laguna de Apoyo Nature Reserve. Every month, we use mist netting to capture birds for a population monitoring longitudinal study. Here is a selection of the birds they caught in photos, followed by a list of all species captured during this period. Grey-headed Tanager (Eucometes penicillata). Photo by Soren Kraack. This gorgeous bird escaped our view for years in the reserve, particularly because it is only found in the southwestern section of the crater. We have never documented the Grey-headed Tanager on the northern side of the crater, where Estacion Biologica is situated. In spite of its bright yellow plumage, it is not easily seen, either! It is a resident species, present year-round. Male Painted Bunting (Passerina ciris) having its plumage reviewed and noted in our data bank. Photo by Soren Kraack. The Painted Bunting is among the most colorful birds in Nicaragua and also in North America, where it nests. The males are exuberantly colored, whereas the females are drab yellow. Our population will be heading northward before the next time we monitor birds by mist netting, next month. This species is of particular concern because of diminishing populations and is listed as Near Threatened on the IUCN Red List. ﻿Habitat loss by the intensification of agriculture in the southern and midwestern US is thought to be the principal cause of its recent population drop, but we know little of birds like this one in their southern habitat. Our captures may contribute to better conservation of this species. We have made another blog entry on this gorgeous bird, where you can read more about it. Stripe-throated Hermit (Phaethornis striigularis). Photo by Soren Kraack. There are at least ten species of hummingbirds found in the Tropical Dry Forest habitat of Laguna de Apoyo Nature Reserve. The Stripe-throated Hermit prefers more dense forest cover than others such as the Cinnamon Hummingbird which is more common at Estacion Biologica. This little bird may have co-evolved with specific flowers from which it feeds, hence the decurved bill. This species has recently been named as distinct from the Little Hermit (Phaethornis longuemareus) which now is limited to South America. Lesser Greenlet (Hylophylus decurtatus). Photo by Soren Kraack. The Tropical Dry Forest habitat abounds in flycatchers (Tyrannidae). Among the less flycatcher-like in behavior of this family is the smallish and retiring Yellow-olive Flycatcher (Tolmomyias sulphurescens). It makes a small pyriform nest with an entrance near the bottom. We often have nests in the yard at Estacion Biologica. The feathers at the top of this bird's head have been wettened by the handler to examine ossification of the cranium-a test for the bird's age. Red-eyed Vireo (Vireo olivaceus). Photo by Soren Kraack. The Red-eyed Vireo migrates long distances between its nesting areas in the US and wintering ranges in Central and South America. Migratory birds are especially vulnerable to the many dangers of a long trip and need to re-establish territories in potentially crowded and hostile areas twice each year. This species is common in season throughout the Laguna de Apoyo Nature Reserve forests. Here is a list of the birds captured during the April mist netting. Notice how different this list is from the birdwatching list of the same date. 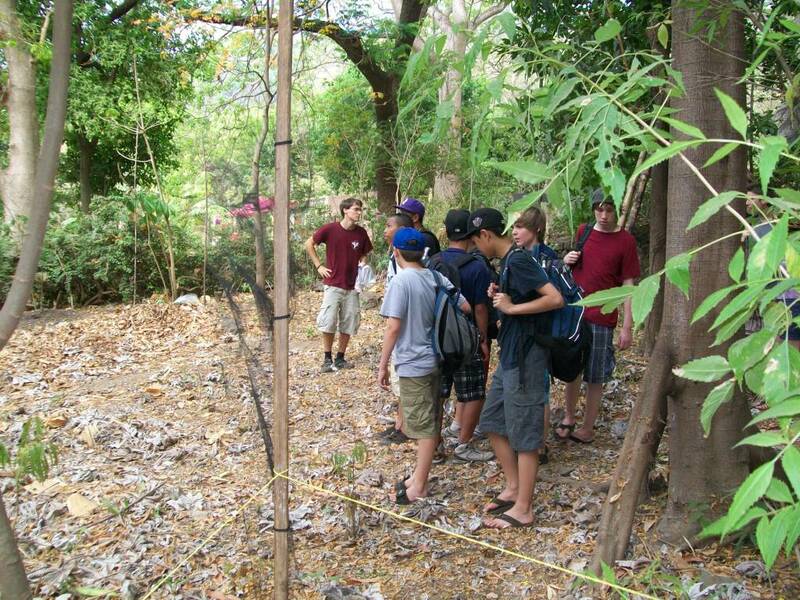 It gives you an idea, too, of what you can see when birdwatching in Laguna de Apoyo Nature Reserve. Salvador and Katia Cardenal made a memorable anthology of music as Duo Guardabarranco. Their music carried messages of social justice, the environment, spirituality, love and solidarity. 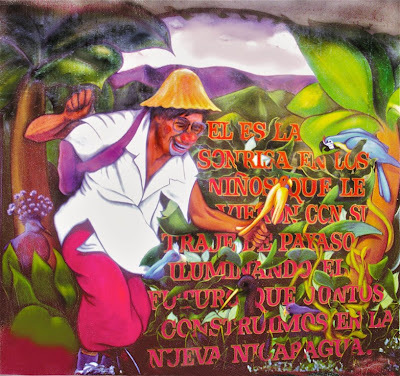 The identity of Nicaragua can be read in their music, a country punished by oppression and violence, full of nature, and love for one's fellow man. Among their songs was a tribute to their uncle Juan, who inspired them to immortalize his Heart of a Child. Here is the song, with its lyrics in Spanish below. Click on song title for video! porque el mar vino a traerlo. y me besa un labio herido. y morir en paz con todos. Because the sea came to take him. Is waiting for us, is waiting for us to call. 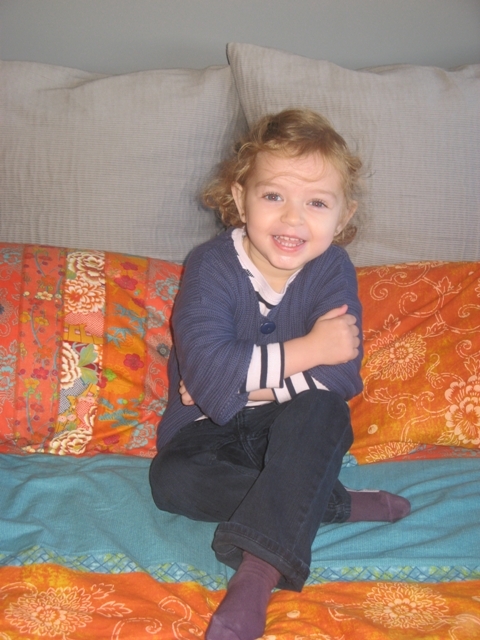 To have love and the heart of a child. And die at peace with everyone. We dive to study fish. We study fish to save them. Doubtless the fish of Laguna de Apoyo are facing a race against time as man continues to encroach on their habitat. Each day, the shores of the crater lake have fewer trees. Houses are built, forests are cut, pesticides are applied, all slowly drying and poisoning the only home for six known species of fish and countless others which have not been "discovered" officially. 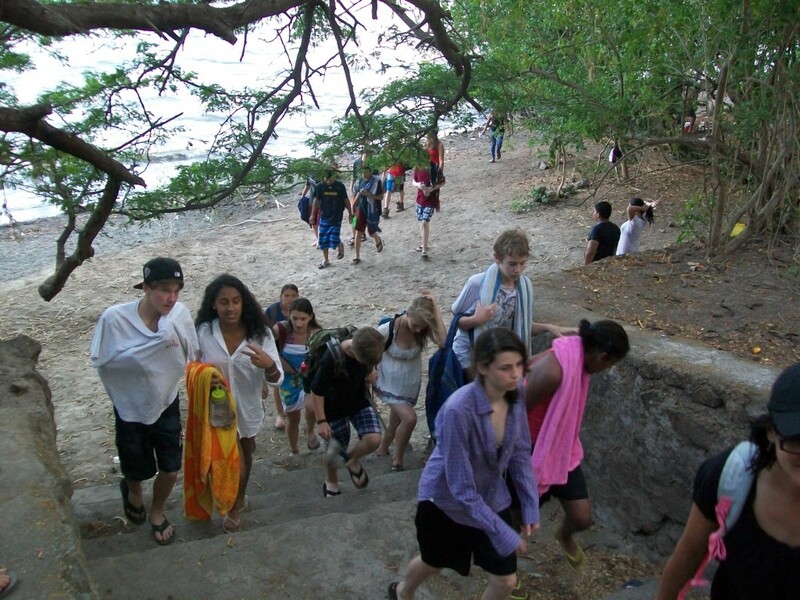 Dozens of fish species remain undiscovered in the waters of Nicaragua. The last listed species, the arrow cichlid, was discovered by George Barlow in 1976, while the other five were discovered between 2008 and 2010 by a multinational research team in collaboration between FUNDECI/GAIA, Jay Stauffer's group at Pennsylvania State University and Matthias Geiger at Maximillian Ludwig University (Munich). They are all very closely related species, evolved since an introduction into the volcanic crater lake 10,000-20,000 years ago. All the fish are descendants of a parent Midas cichlid (Amphilophus citrinellus) stock. 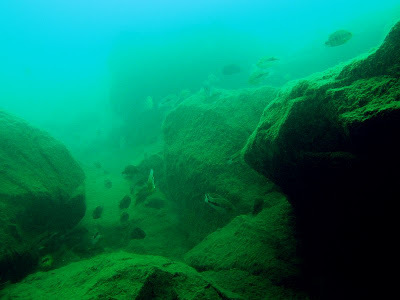 In the photo below, taken while SCUBA diving on one of our monitoring sites in Laguna de Apoyo, several of the above-mentioned species are present. A multispecies Amphilophus school in our monitoring site. Photo by Balasz Lerner. We count fish numbers at fixed depths in specific locations monthly, as well as fish nests. The counting methods have permitted us to gain the extensive experience necessary to begin to decipher the differences between the fish species-distinctions that the fish themselves "see" but we do not nearly as easily. Lorenzo Lopez is taking notes on fish populations in our fish monitoring activity in Laguna de Apoyo. This study is important because it permits us to detect changes in the lake habitat and fish populations, hopefully giving us time to respond in the event of a potential fish kill or extinction event. We are still trying to understand just how many of each fish species are in the lake in order to interpret our results better. 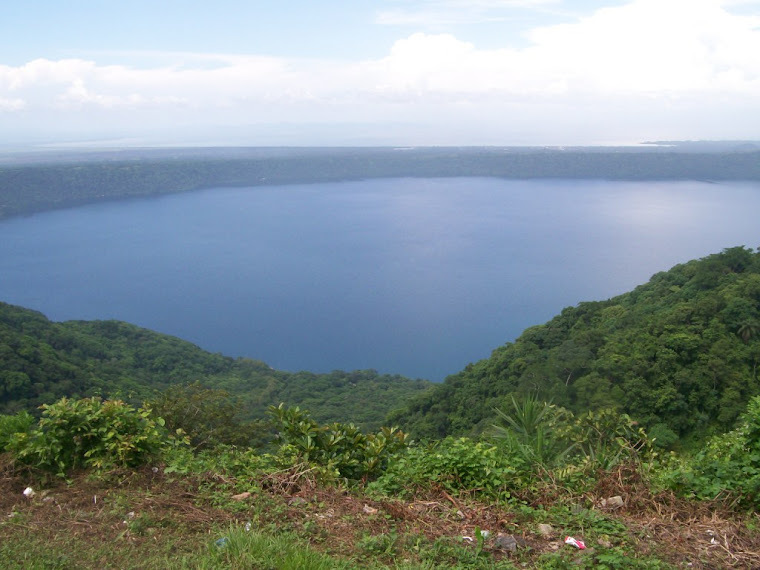 We have recently published a baseline of fish populations and breeding rates at three sites in Laguna de Apoyo, which you can find here. Potamocarcinus nicaraguensis in Laguna de Apoyo. ﻿Little is known about the crabs that inhabit the Nicaraguan Great Lakes system. We occasionally see them eating a dead fish, or more often, hiding in a hole or beneath an object. We usually see two or three each dive. We have begun counting them systematically, to look for trends in their population over time. You can join us! Please let us know if you would like to dive with us in Laguna de Apoyo. If you are a certified diver, and you would like to accompany us, you can learn about the rare and threatened fishes of the lake, see them up close, and help us collect data that ultimately will contribute to scholarly publications about these fish and their habitat. We know far too little about these fish, and your participation helps us learn more about how to protect these species. 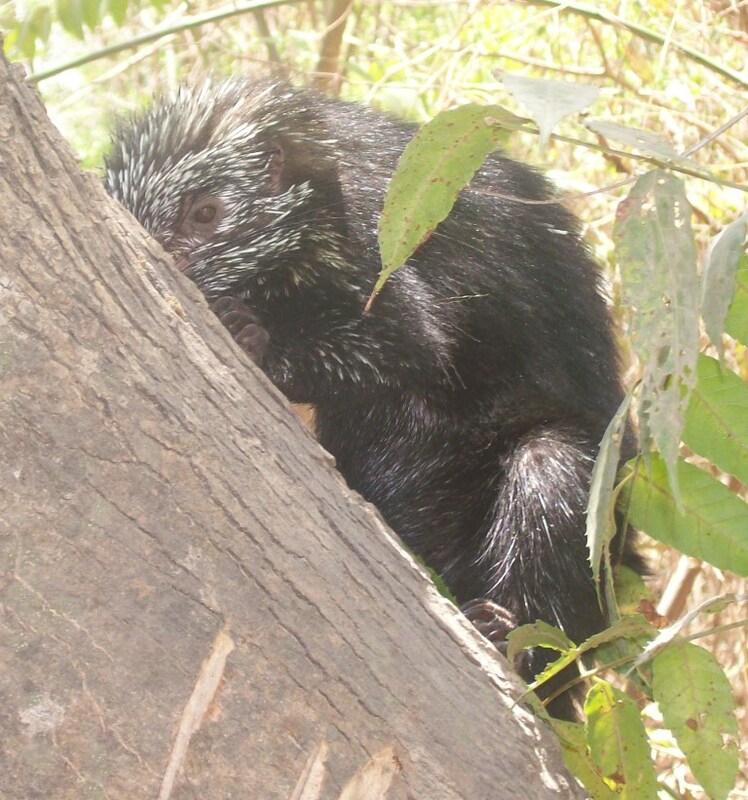 We are saving Nicaraguan wild nature, and you can help. 1. Participate in our diving research program as a diver. Any certified diver can contribute by "buddying" on a research dive. 2. 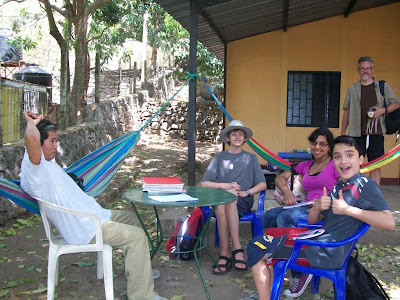 Visit us at Estacion Biologica in Laguna de Apoyo Nature Reserve and meet us personally. 3. Tell others about us and the nature conservation activities in Nicaragua. 4. Patronize businesses with responsible management practices such as permits, pesticide use, waste management, etc. 5. Volunteer some time with us-we have a constant need for volunteers outside the water as much as inside, from computer data management, conservation professional support, to physical activities without technical expertise. 6. Collaborate with us as a visiting scientist. We have numerous projects and topics that could benefit from the involvement of more researchers. Our group publishes more than any research group in Nicaragua, and we would like to work with more international and local collaborators. 7. Donate-whether in cash or used dive equipment in good condition. We can get material transported from the US if necessary. We can receive financial donations via paypal, and provide tax information (we are a Nicaraguan registered not-for-profit). Please contact us if you want to help. 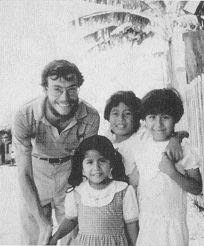 This project depends on individual, small-scale contributions, so your can make a difference. Most species of sea turtles today are in grave risk of extinction. One important factor in their plight is the long-held, tasty tradition of eating sea turtle eggs. 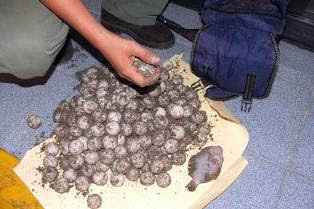 Poachers dig the eggs up on the beaches during the turtle reproduction season (June to December), or they are simply harvested as the turtle drops them into a hole on the beach. 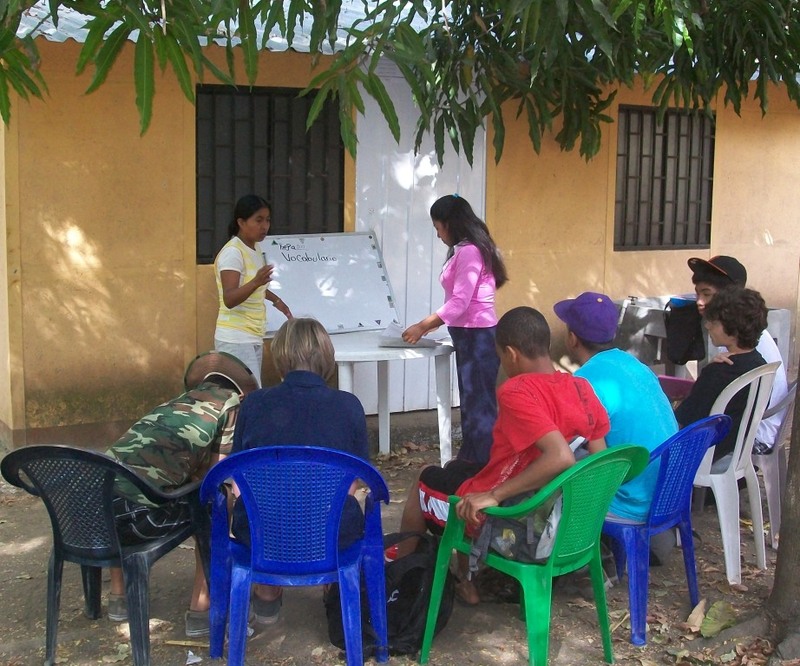 In Nicaragua, a campaign against the consumption of turtle eggs was very successful at raising the consciousness of the public and decision-makers. The drawing below is the logotype for the campaign. NO COMO HUEVOS DE TORTUGA! Click the hatching egg for video. This restaurant in Laguna de Apoyo serves turtle eggs, in spite of the disapproval of a wide variety of people and the law against sale of turtle eggs. Photo Nathan Biondolino. Here, the waiter at "Monteverde" Restaurant in Laguna de Apoyo is serving turtle eggs to a client. Obviously, sea turtle conservation is completely incompatible with the disgusting practice of the traffic in turtle eggs. The sale of turtle eggs should be stopped at every level, including the boycott of restaurants that continue to offer turtle eggs. We recommend a boycott of this restaurant and any other that sells turtle eggs. Turtle eggs should be hatched on the beach, not placed on a plate to eat. Photo Nathan Biondolino. Friends don't let friends eat turtle eggs. Photo Nathan Biondolino. Please do not patronize businesses that sell turtle eggs! Photo Nathan Biondolino. What can you do to help to conserve sea turtles? Don't eat turtle eggs. Don't let your friends eat turtle eggs. Denounce all traffic in turtle eggs to the authorities. If you see any wild animal mistreatment or illegal commerce in wildlife or if you see turtle eggs on the menu in a restaurant, please contact us! Click the "escudo" to contact http://www.gaianicaragua.org/.